A quick post to cheer myself up after the rather sad Local Area Group meeting I went to this morning where the lack of communication to parents/ apathy of parents means that virtually no-one attended a set of consultation meetings about the future of our local children's centers which has led to some of them being about to be 'de-designated' (read that as 'closed down'). Over the whole county of East Sussex there were only 180 responses to questionnaires asking for people's opinions on the proposals to close the centers, which could have had a lot to do with the use of the meaningless word 'de-designate' instead of 'close'. Added to this, the unrelated loss of my closest venue means that there is potentially no children's center within sensible walking distance of my street, which is in the middle of one of the most deprived areas of one of the most deprived towns in Britain. I'm fortunate to have a car, but I can see how this decision will impact on other local families, especially with current proposals for cuts in bus services. Even with a car, unrelated changes to the venues and groups mean that I am no longer attending Children's Center play groups, which had been the backbone of our week and of my volunteering, and have lost touch with most of the families I was supporting through the groups. I'm no political radical, but the apathy of folks locally to get involved and feel like they can make a difference is a real problem. We won't move forward as a society until decisions are made with the people they affect rather than a top down approach were things are done 'for' or 'to' people. I want to make it clear I feel there is no allocation of blame to the Children's Centers themselves who did the very best they could with the hand they were dealt, hosting consultations and providing opportunities for people to have their say, and who continue to provide many amazing services and opportunities. I'm doing my best by nudging anyone who's nearby and even half interested into training and volunteering opportunities, going to meetings to try to give families a voice, and generally promoting the work of any organisation I come across who is involved in families, including education opportunities for parents, but we need more people with access to the 'target' groups who need the services most (and use them least) to give the families they know a little push to go along to all the amazing opportunities that are on offer. The target groups include young parents (under 20's), incoming families for whom English is not their first language, unemployed parents and families on low incomes among others. Most of us know, or are, families that hit one or more of these targets, so everybody has a chance to make sure services are well used and that everybody benefits from what is already on offer. If we don't use them, and fight for the ones that are already well used, we will lose them. Anyhow, on to the cheery stuff. We all know recycling is a good thing, and that it doesn't have to always mean chucking stuff in the recyclables wheely bin for the council to send off to be re-used. Here's a simple use for a 2 liter (4 pint) plastic milk carton to make an elephant and a weird-looking rhino. This is an idea I pinched from an advert for a craft pack in a Tesco's magazine, but mine definitely looks as though the kids made them rather than an Art Graduate! Cut your bottle in half so that your cut is at the level of the bottom of the handle - the handle will be the elephants trunk (the circular hole in the bottom half of the bottle will be where you poke a horn through for your rhino). Sames as above, but this time roll some card into a long narrow cone, poke it up through the hole left by the handle of the bottle, secure with sticky tape. I poked a lolly stick into the cone and secured it in the base of the bottle with blue-tack so the horn wouldn't be pushed in when the boys play with the rhino. Tape card over the bigger of the two holes left by removing the top of the bottle to use for the elephant. Cover everything as above with strips of paper, leave to dry and paint if you wish to. If you don't feel like making the rhino, as Toby didn't, you can just leave the container open, cover it in paper and decorate how you like to make a pen pot. The cutting is best done with big people scissors, so if you have small children I would do the cutting for them. The edges of the carton can be a bit sharp, so you may want to cover these first by papering over them before you let you littlies loose on the rest of it. Googly eyes are a choke hazard so avoid with smaller littlies. The milk bottle top is also a choke hazard, so ensure it's pasted over with paper. In general supervised making, supervised play, discard if it's starting to fall to bits - usual stuff. This activity targets creativity, imagination and also fine motor skills - the act of tearing up the magazine for example is a lovely sensory activity that builds fine grip and hand control. 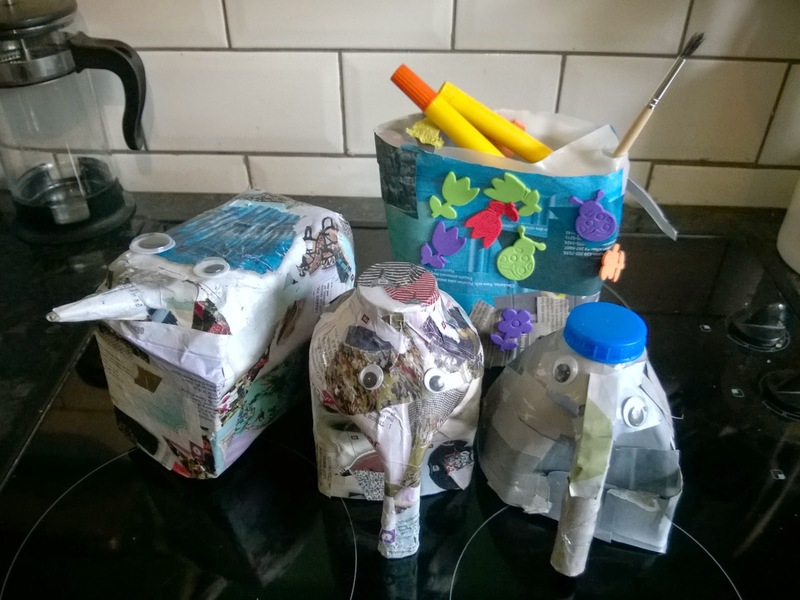 You can use images to show little ones what they are making, and also use the finished items as part of a home-made safari collection (we have a cardboard box giraffe too) which you can use as part of an imaginary zoo adventure or visit to Africa. Extensions include showing children on a map or globe where your animals come from and talking about the kinds of things they will need in their home, such as water and food.